Oh man guys…some mornings, the struggle is just so real. Fortunately, a solid breakfast is pretty good motivation to get up and moving quickly and this one is pretty darn good. 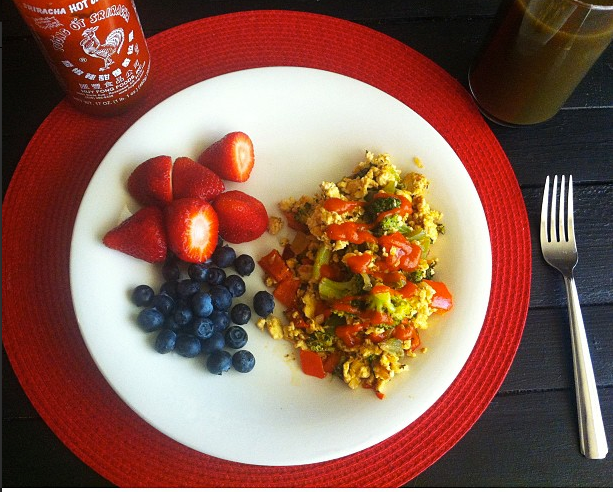 This breakfast scramble is packed with protein but doesn’t have any of the cholesterol because it’s doesn’t contain any eggs, making it a fantastic vegan option. And Sriracha to top it off(duh). 1) Prepare the tofu by draining the liquid and then wrapping the block in a towel and pressing between two plates to remove some of it’s moisture. 2) Prepare veggies by washing and chopping into bite sized pieces. 3) Heat olive oil in a skillet on medium heat. 4) Mince the garlic and add to the pan, letting it sauté for a minute or two. 5) Add the chopped veggies to the pan and sauté for a few minutes, until they start to soften a bit. 6) Crumble the tofu into the hot pan with the veggies and immediately sprinkle in turmeric and nutritional yeast. Stir well to combine. Feel free to mix it up too, you could put just about any veggie in here and it would be delicious. This scramble also stores well in the fridge (unlike eggs), so it’s an easy recipe to make up at the beginning of the week and then stuff into tortillas for breakfast burritos all week!